Cover artwork: Photograph by Benjamin Ealovega. The guitar is something of the national instrument of South America—this selection brings together many of the styles and genres of that vast continent in a colourful blend of melodies, rhythms, and harmonies. The continent of South America, with its diverse countries and various lines of historical development, has stimulated the creation of many musical traditions. But throughout the heterogeneous patterns of culture, the guitar has a central part to play as a national instrument in all South American countries. This selection brings together many of the styles and genres of that vast continent in a colourful blend of melodies, rhythms, and harmonies. Astor Piazzolla, born in Mar del Plata, Argentina, emigrated with his family to New York in 1924. As a child prodigy he learned to play the bandoneón, the button accordion popular with Argentinian tango orchestras. Piazzolla returned to Argentina in 1937 where he developed his compositional capabilities. In the early 1950s, he studied composition with Nadia Boulanger in Paris for four months. She encouraged him to develop artistically through the Argentinian tango rather than devote himself to European genres. On Piazzolla’s return to Buenos Aires, he formed various ensembles. In 1958, he lived for a while in Manhattan where he assimilated more jazz elements. Piazzolla went back to Argentina in 1960, his musical life continuing with constant foreign tours. By the 1980s, Piazzolla was famous world-wide. He died in Buenos Aires in 1992. The composer’s works include theatre music, film scores, concertos, chamber music, and songs, as well as many instrumental pieces. Composed in 1974, Libertango was first recorded in March 1975 by Guy Marchand with the lyrics 'Moi, je suis tango'. It became an immediate hit in France, selling 30,000 copies a week. Oblivion was part of a score for Bellocchio’s movie Enrico IV, first shown in 1984, a screen adaptation of Pirandello’s drama. The play tells of an actor who falls from his horse while enacting the role of Henry IV. When he recovers consciousness, he believes he really is King Henry. His nephew, Count de Nolli, arranges for him to live in a remote villa where actors perform as courtiers and simulate a medieval environment. Adiós Nonino ('Farewell Nonino') is an elegiac piece written following the death of the composer’s father, Vicente, in October 1959. Piazzolla regarded this as the finest tune he ever composed, and performed it many hundreds of times in at least twenty arrangements. Verano porteño ('Summer in Buenos Aires') was originally written for Muñoz’s play Melenita de oro ('The Golden Mop of Hair'), staged in 1965. It became the first of Las cuatro estaciones porteñas ('The Four Buenos Aires Seasons'), which, like Vivaldi’s Four Seasons, express the changing moods of the year. Milonga del ángel (composed 1962), part of a triptych, presents the gentle nature of the angel. Born in Montevideo, Uruguay, Gerardo Matos Rodríguez began composing in 1917 and subsequently travelled widely throughout Europe, serving for a while as the Uruguayan consul in Germany. Though he wrote many tangos, La cumparsita, written in 1916, became one of the most famous. In 1924, Argentinian singer Pascual Contursi wrote lyrics to the piece and recorded it with the title of Si supieras ('If you knew'). Matos Rodríguez, while living in Paris, became aware of the work’s popularity and spent the next twenty years trying to gain the copyright of La cumparsita, a legal conflict which finally ended in 1948 when the original title was established. con un viento de esperanza, sube y sube. about that crazy fantasy of dreaming. on a breeze of hope, higher and higher. Egberto Gismonti was born in Carmo, in the state of Rio de Janeiro, from a Sicilian father and Lebanese mother. As a boy he studied piano and then, like Astor Piazzolla, went to Paris to take lessons in composition with Nadia Boulanger. Gismonti taught himself to play the guitar but preferred to play instruments with more than six strings to create a more complex texture. Over some fifty years he has proved to be an amazing virtuoso who brought new techniques and sonorities to the guitar. Agua y vinho ('Water and wine'), one of his most famous compositions, is characterized by its mood of Brazilian saudade, a mixture of sadness and sweet nostalgia. João Teixeira Guimarães (also known as João Pernambuco), was born in Jatobá, in the state of Maranhão, in north-eastern Brazil. He moved to Rio de Janeiro in 1902 where he built up a reputation among local musicians as a singer and performer. It is estimated that over the decades he composed more than a hundred songs including pieces in rhythmic forms such as jongos, maxixes, toadas, etc. Sons de carrilhões, one of the most popular solos in the guitar’s history, is a superb example of the choro-maxixe form. João Pernambuco recorded the piece in 1926 and it was first published in notation in the 1930s. The eminent Brazilian guitarist, Turibio Santos, edited a revised version of the work in 1978 (publ. Ricordi Brasileira). Dilermando Reis, composer and guitarist, born in São Paulo State, lived most of his life in Rio de Janeiro. He was a prolific recording artist who left a rich legacy of albums. He specialized in waltzes and choros of a poignantly emotional kind. Se ela perguntar ('If she asks') has an exquisite melodic line of great sensitivity. Antonio Lauro, the great Venezuelan composer, was originally a pianist, but decided to dedicate himself to the guitar after hearing a recital by Agustín Barrios Mangoré. Lauro is the authentic voice of Venezuelan music, especially in his waltzes which combine folkloric inspiration with a sophisticated awareness of guitar sonorities. Lauro’s love of the waltz, quite different from the European varieties of the dance, is exemplified in these vivacious Venezuelan Dances. The title of El Marabino is a reference to a native of Maracaibo, a province where the composer lived for a time. Abel Fleury, born in Dolores, in Buenos Aires province, was a composer and guitarist. He first learned guitar from his mother but later studied with Domingo Prat (1886-1994), the Spanish-born guitarist, composer, and esteemed pedagogue and guitar historian. In 1933 Fleury moved to Buenos Aires and from there built up a reputation as an eminent recitalist and composer. Through his association with poet Fernando Ochoa (who also wrote lyrics for Te vas milonga), Fleury reached a wide public. Between 1930 and 1954, he made numerous recordings of his compositions and in 1940 joined the Argentine Folk Music Quartet. From 1948, he began extensive tours of South America and later gave concerts in Spain Portugal, France, and Belgium. Fleury died of a heart condition at the age of fifty-five. The milonga as a form is a song genre of Uruguay and Argentina, usually in a light mood. Fleury’s Milonga achieves its effects by means of an elegant melodic line and an accompaniment of rhythmic arpeggiated patterns. Jorge Cardoso, born in Posadas, Argentina, studied composition at the University of Córdoba, Argentina, and later qualified as a medical doctor. He now lives in Madrid and has established himself as both an outstanding guitarist and composer. He has given recitals all over the world and is a prolific recording artist. His Milonga is one of the favourite pieces among guitarists for its poetic blending of subtle rhythms and melodic inventiveness. Julio Sagreras, born in Buenos Aires, began learning the guitar at an early age from his parents, both of whom were guitarists. He soon became renowned as performer and teacher, and established a reputation as a prolific composer. As well as writing more than one hundred guitar compositions, he remains well known for his seven volume guitar tutor, covering a unique course of seven years of technical and interpretative work. Violetas ('Violets') is a lyrical waltz, arranged in contrasting episodes. Le continent sud-américain, avec ses pays divers et un développement historique composite, a stimulé la création de nombreuses traditions musicales. Mais dans ce canevas culturel hétérogène, la guitare joue un rôle essentiel en tant qu’instrument national dans tous les pays sud-américains. La sélection contenue dans cet album regroupe beaucoup des styles et genres de ce vaste continent dans un ensemble coloré de mélodies, rythmes et harmonies. Astor Piazzolla, né à Mar del Plata en Argentine, émigra à New York avec sa famille en 1924. Jeune prodige, il apprit à jouer du bandonéon, instrument diatonique populaire dans les orchestres de tango argentin. Piazzolla retourna en Argentine en 1937, où il développa des compétences en composition. Au début des années 1950, il étudia la composition pendant quatre mois à Paris auprès de Nadia Boulanger. Elle l’encouragea à s’épanouir sur le plan artistique au travers du tango argentin plutôt qu’en se consacrant aux genres européens. De retour à Buenos Aires, Piazzolla créa plusieurs ensembles. En 1958, il séjourna brièvement à Manhattan, où il assimila des éléments du jazz. Piazzolla retourna en Argentine en 1960, poursuivant sa carrière musicale dans le cadre de tournées incessantes à l’étranger. À l’aube des années 1980, sa réputation était internationale. Le compositeur est décédé à Buenos Aires en 1992. Parmi ses œuvres, on recense musique de théâtre, musique de film, concertos, musique de chambre et chansons, ainsi que de nombreuses pièces instrumentales. Libertango, composé en 1974, a été enregistré pour la première fois en mars 1975 par Guy Marchand, avec les paroles: «Moi, je suis tango». Le titre remporta un succès instantané en France, vendant 30 000 exemplaires par semaine. Oblivion faisait partie d’une composition pour le film de Bellocchio, Enrico IV, diffusé pour la première fois en 1984 en tant qu’adaptation à l’écran du drame de Pirandello. La pièce rapporte le récit d’un acteur qui tombe de son cheval en incarnant Henri IV. Lorsqu’il reprend connaissance, il croit vraiment être le roi Henri. Son neveu, le comte de Nolli, l’envoie vivre dans un village isolé où des acteurs tiennent le rôle de courtisans dans un cadre médiéval simulé. Adiós Nonino («Adieu Nonino») est une élégie composée après la mort de Vicente, père du compositeur, en octobre 1959. Piazzolla la considérait comme la plus belle mélodie de sa composition, et il l’a interprétée des centaines de fois au travers d’une vingtaine d’arrangements. Verano porteño («Été à Buenos Aires») avait été initialement composé pour la pièce de théâtre de Muñoz, Melenita de oro («La chevelure dorée»), portée à la scène en 1965. Cette pièce allait former la première des Cuatro estaciones porteñas («Quatre saisons de Buenos Aires»), qui, à l’instar des Quatre Saisons de Vivaldi, expriment les humeurs changeantes de l’année. Milonga del ángel (1962), partie d’un triptyque, présente la nature bienfaisante de l’ange. l’ambition de mon quartier s’est donné deux ailes. Natif de Montevideo en Uruguay, Gerardo Matos Rodríguez commença à composer en 1917, avant de voyager dans toute l’Europe, où il assura un certain temps les fonctions de consul d’Uruguay en Allemagne. Au fil de ses voyages, il composa de nombreux tangos. La cumparsita, créé en 1916, devint l’un de ses plus célèbres. En 1924, le chanteur argentin Pascual Contursi le mit en paroles et l’enregistra sous le nom Si supieras («Si tu savais»). Alors qu’il séjournait à Paris, Matos Rodríguez prit conscience de la popularité de son œuvre et consacra les vingt années suivantes à essayer d’obtenir les droits d’auteur de La cumparsita, dans un conflit juridique qui se termina en 1948 lorsque le titre original fut confirmé. cette folle fantaisie de rêver. Egberto Gismonti est né à Carmo dans l’État de Rio de Janeiro, d’un père sicilien et d’une mère libanaise. Enfant, il a appris le piano puis, comme Astor Piazzolla, il s’est rendu à Paris pour étudier la composition avec Nadia Boulanger. Gismonti est autodidacte à la guitare mais il préfère jouer des instruments de plus de six cordes pour créer des textures plus complexes. Depuis plus de cinquante ans, il s’illustre en tant que formidable virtuose, apportant de nouvelles techniques et sonorités à la guitare. Agua y vinho («Eau et vin»), l’une de ses compositions parmi les plus célèbres, se distingue par son ambiance de saudade brésilienne, mélange de tristesse et de douce nostalgie. João Teixeira Guimarães (également connu sous le nom de João Pernambuco), est né à Jatobá dans l’État de Maranhão au nord-est du Brésil. Il s’installa à Rio de Janeiro en 1902, où il se distingua parmi les musiciens locaux en tant que chanteur et interprète. Au fil des décennies, il aurait composé plus d’une centaine de chansons, incluant des pièces de formes rythmiques telles que des jongos, maxixes, toadas, etc. Sons de carrilhões, l’un des solos parmi les plus populaires de l’histoire de la guitare, est un remarquable exemple de la forme choro-maxixe. João Pernambuco a enregistré cette pièce en 1926, avant qu’elle ne soit publiée dans les années 1930. L’éminent guitariste brésilien, Turibio Santos, a arrangé une version révisée de l’œuvre en 1978 (éditée par Ricordi Brasileira). Dilermando Reis, compositeur et guitariste né dans l’État de São Paulo, vécut la plus grande partie de sa vie à Rio de Janeiro. C’était un artiste du disque prolifique, qui a laissé un riche répertoire d’albums. Il s’était spécialisé dans les valses et les choros dégageant une émotion poignante. Se ela perguntar («Si elle demande») contient une ligne mélodique raffinée d’une grande sensibilité. Antonio Lauro, le grand compositeur vénézuélien, pianiste à l’origine, décida de se consacrer à la guitare après avoir assisté à un récital d’Agustín Barrios Mangoré. Lauro est la véritable voix de la musique vénézuélienne, en particulier dans ses valses, qui allient l’inspiration folklorique avec une connaissance élaborée des sonorités de la guitare. L’amour de Lauro pour la valse, très différente des variantes européennes de cette danse, ressort dans le caractère enlevé de ses Valses venezolanos. Le titre El Marabino fait référence à un natif de Maracaibo, province où séjourna le compositeur pendant un certain temps. Abel Fleury, né à Dolores dans la province de Buenos Aires, était compositeur et guitariste. Il apprit la guitare avec sa mère, avant d’étudier avec Domingo Prat (1886-1994), guitariste espagnol, compositeur, pédagogue estimé et spécialiste de l’histoire de la guitare. En 1933, Fleury s’installa à Buenos Aires, où il s’illustra en tant que concertiste et compositeur. Au travers de son association avec le poète Fernando Ochoa (qui a également écrit les paroles de Te vas milonga), Fleury a touché un large public. Entre 1930 et 1954, il enregistra un grand nombre de ses compositions et, en 1940, rejoignit le quatuor de musique folklorique argentine. À partir de 1948, il entreprit de grandes tournées en Amérique du Sud, avant des concerts en Espagne, au Portugal, en France et en Belgique. Fleury succomba à des problèmes cardiaques à l’âge de 55 ans. La milonga est un genre de chanson originaire d’Uruguay et d’Argentine, généralement d’humeur légère. La milonga de Fleury produit cet effet au travers d’une ligne mélodique élégante, avec un accompagnement de motifs arpégés rythmiques. Jorge Cardoso, né à Posadas en Argentine, a étudié la composition à l’université de Córdoba en Argentine, avant d’obtenir un diplôme de docteur en médecine. Il vit désormais à Madrid où il s’est illustré en tant que guitariste et compositeur. Il a donné des concerts dans le monde entier et c’est un artiste de studio prolifique. Sa Milonga est l’une des œuvres les plus appréciées des guitaristes pour son alliance poétique de rythmes subtils et de créativité mélodique. Julio Sagregas, natif de Buenos Aires, commença la guitare à un très jeune âge auprès de ses parents, tous deux guitaristes. Il s’illustra rapidement en tant que concertiste et professeur, avec une réputation bien établie de compositeur prolixe. En plus de sa centaine de compositions pour la guitare, il est célèbre pour sa méthode de guitare en sept volumes, couvrant un parcours unique sur sept ans autour d’œuvres techniques et interprétatives. Violetas («Violettes») est une valse lyrique ponctuée d’épisodes contrastés. Der südamerikanische Kontinent mit seinen verschiedenen Ländern und verschiedenen historischen Entwicklungslinien hat die Entstehung vieler Musiktraditionen angeregt. Doch in den heterogenen Kulturmustern spielt die Gitarre als Nationalinstrument in allen südamerikanischen Ländern eine zentrale Rolle. Diese Auswahl vereint viele Stile und Genres dieses riesigen Kontinents in einer farbenfrohen Mischung aus Melodien, Rhythmen und Harmonien. Astor Piazzolla, geboren in Mar del Plata, Argentinien, emigrierte 1924 mit seiner Familie nach New York. Als Wunderkind lernte er das Bandoneón zu spielen: das Knopfakkordeon, das bei argentinischen Tangoorchestern sehr beliebt ist. Piazzolla kehrte 1937 nach Argentinien zurück, wo er seine kompositorischen Fähigkeiten entwickelte. Anfang der 1950er Jahre studierte er vier Monate lang Komposition bei Nadia Boulanger in Paris. Sie ermutigte ihn, sich künstlerisch durch den argentinischen Tango weiterzuentwickeln, anstatt sich den europäischen Genres zu widmen. Nach Piazzollas Rückkehr nach Buenos Aires, gründete er verschiedene Ensembles. 1958 lebte er eine Weile in Manhattan, wo er weitere Jazzelemente aufnahm. Piazzolla kehrte 1960 nach Argentinien zurück; sein musikalisches Leben ging dabei mit ständigen Auslandstourneen weiter. Bis zu den 1980er Jahren war Piazzolla dann weltweit berühmt. Er starb 1992 in Buenos Aires. Zu den Werken des Komponisten gehören Theatermusik, Filmmusik, Konzerte, Kammermusik und Lieder sowie zahlreiche Instrumentalstücke. Der 1974 komponierte Libertango wurde erstmals im März 1975 von Guy Marchand mit dem Text „Moi, je suis tango“ aufgenommen. Es wurde in Frankreich sofort zum Hit und verkaufte sich 30’000 Mal pro Woche. Oblivion war Teil einer Partitur für Bellocchios 1984 erstmals gezeigten Film Enrico IV, einer Verfilmung von Pirandellos Drama. Das Stück erzählt von einem Schauspieler, der von seinem Pferd fällt, während er die Rolle von Heinrich IV. spielt. Als er das Bewusstsein wiedererlangt, glaubt er, dass er wirklich König Heinrich sei. Sein Neffe, Graf de Nolli, lässt ihn in einer abgelegenen Villa wohnen, in der Schauspieler als Höflinge auftreten und eine mittelalterliche Umgebung simulieren. Adiós Nonino („Adieu Nonino“) ist ein elegisches Stück, das nach dem Tod des Vaters des Komponisten, Vicente, im Oktober 1959 geschrieben wurde. Piazzolla betrachtete dies als die schönste Melodie, die er je komponiert hatte, und spielte sie viele hundert Mal in mindestens zwanzig Arrangements. Verano porteño („Sommer in Buenos Aires“) wurde ursprünglich für Muñoz’ Stück Melenita de oro („Der goldene Haarschopf“) geschrieben, das 1965 inszeniert wurde. Es wurde das erste von Las cuatro estaciones porteñas („Die vier Jahreszeiten von Buenos Aires“), die wie Vivaldis Vier Jahreszeiten die wechselnden Stimmungen des Jahres zum Ausdruck bringen. Milonga del ángel (komponiert 1962), Teil eines Triptychons, zeigt die sanfte Natur des Engels. Der in Montevideo, Uruguay, geborene Gerardo Matos Rodríguez begann 1917 mit dem Komponieren und reiste anschliessend durch ganz Europa, wo er einige Zeit in Deutschland als Konsul von Uruguay tätig war. Obwohl er viele Tangos schrieb, wurde La cumparsita, geschrieben 1916, zu einem der berühmtesten. 1924 schrieb der argentinische Sänger Pascual Contursi Texte zu dem Stück und nahm es unter dem Titel Si supieras („Wenn Du wüsstest“) auf. Matos Rodríguez wurde sich, während er in Paris lebte, der Popularität des Werkes bewusst und verbrachte die nächsten zwanzig Jahre mit dem Versuch, das Urheberrecht an La cumparsita zu erlangen: Ein Rechtsstreit, der schliesslich 1948 endete, als der ursprüngliche Titel festgelegt wurde. über diese verrückte Fantasie des Träumens. auf einem Hauch von Hoffnung, höher und höher. Egberto Gismonti wurde in Carmo, im Bundesstaat Rio de Janeiro, als Sohn eines sizilianischen Vaters und einer libanesischen Mutter geboren. Als Junge studierte er Klavier und ging dann, wie Astor Piazzolla, nach Paris, um Kompositionsunterricht bei Nadia Boulanger zu nehmen. Gismonti brachte sich selbst das Gitarrenspiel bei, zog es aber vor, Instrumente mit mehr als sechs Saiten zu spielen, um eine komplexere Textur zu erzeugen. In rund fünfzig Jahren hat er sich als erstaunlicher Virtuose erwiesen, der neue Techniken und Klangfarben auf die Gitarre gebracht hat. Agua y vinho („Wasser und Wein“), eine seiner berühmtesten Kompositionen, zeichnet sich durch seine brasilianische Saudade-Stimmung aus: eine Mischung aus Traurigkeit und süsser Nostalgie. João Teixeira Guimarães (auch bekannt als João Pernambuco), wurde in Jatobá, im Bundesstaat Maranhão im Nordosten Brasiliens geboren. Er zog 1902 nach Rio de Janeiro, wo er sich bei den lokalen Musikern einen Namen als Sänger und Performer machte. Es wird geschätzt, dass er im Laufe der Jahrzehnte über hundert Lieder komponiert hat, darunter Stücke in rhythmischen Formen wie Jongos, Maxixes, Toadas etc. Sons de carrilhões, eines der populärsten Soli in der Geschichte der Gitarre, ist ein hervorragendes Beispiel für die Form des Choro-Maxixe. João Pernambuco nahm das Stück 1926 auf und veröffentlichte es erstmals in den 1930er Jahren als Noten. Der bedeutende brasilianische Gitarrist Turibio Santos hat 1978 eine überarbeitete Fassung des Werkes herausgegeben (Publ. Ricordi Brasileira). Dilermando Reis, Komponist und Gitarrist, geboren im Bundesstaat São Paulo, lebte die meiste Zeit seines Lebens in Rio de Janeiro. Er war ein produktiver Studiomusiker, der ein reiches Vermächtnis an Alben hinterliess. Er spezialisierte sich auf Walzer und Choros von ergreifend emotionaler Art. Se ela perguntar hat eine exquisite melodische Linie von grosser Sensibilität. Antonio Lauro, der grosse venezolanische Komponist, war ursprünglich Pianist, entschied aber nach einem Rezital von Agustín Barrios Mangoré, sich der Gitarre zu widmen. Lauro ist die authentische Stimme der venezolanischen Musik, besonders in seinen Walzern, die folkloristische Inspiration mit einem ausgeprägten Bewusstsein für die Klangfülle der Gitarre verbinden. Lauros Liebe zu einem Walzer, der so ganz anders als die europäischen Varianten des Tanzes ist, zeigt sich in diesen lebhaften Venezolanischen Tänzen. Der Titel El Marabino bezieht sich auf einen aus Maracaibo Gebürtigen—einer Provinz, in der der Komponist eine Zeitlang lebte. Abel Fleury, geboren in Dolores, Provinz Buenos Aires, war Komponist und Gitarrist. Er lernte zunächst Gitarre von seiner Mutter und studierte später bei Domingo Prat (1886-1994), dem in Spanien geborenen Gitarristen, Komponisten und angesehenen Pädagogen und Gitarrenhistoriker. 1933 übersiedelte Fleury nach Buenos Aires und erwarb sich von dort aus den Ruf eines bedeutenden Rezitalisten und Komponisten. Durch seine Zusammenarbeit mit dem Dichter Fernando Ochoa (der auch Texte für Te vas milonga schrieb) erreichte Fleury ein breites Publikum. Zwischen 1930 und 1954 machte er zahlreiche Aufnahmen seiner Kompositionen und stiess 1940 zum Cuarteto de Música Popular Argentina. Ab 1948 begann er ausgedehnte Tourneen durch Südamerika und gab später Konzerte in Spanien, Portugal, Frankreich und Belgien. Fleury starb im Alter von fünfundfünfzig Jahren an einem Herzleiden. Die Milonga-Form ist ein Liedgenre aus Uruguay und Argentinien, meist in beschwingter Stimmung. Fleurys Milonga erreicht ihre Wirkung durch eine elegante Melodie-Linie und eine Begleitung aus rhythmischen Arpeggio-Mustern. Jorge Cardoso, geboren in Posadas, Argentinien, studierte Komposition an der Universität von Córdoba, Argentinien, und qualifizierte sich später als Arzt. Er lebt heute in Madrid und hat sich als herausragender Gitarrist und Komponist etabliert. Er hat weltweit Konzerte gegeben und ist auch ein produktiver Studio-Musiker. Seine Milonga ist eines der Lieblingsstücke der Gitarristen, weil sie eine poetische Mischung aus subtilen Rhythmen und melodischem Erfindungsreichtum ist. Julio Sagreras, geboren in Buenos Aires, begann schon früh mit dem Gitarrenunterricht bei seinen Eltern, die beide Gitarristen waren. Schon bald wurde er als Interpret und Lehrer bekannt und etablierte sich als produktiver Komponist. Neben dem Schreiben von über hundert Gitarrenkompositionen ist er nach wie vor für seine siebenbändige Gitarrenlehre bekannt, die einen einzigartigen Kurs von sieben Jahren technischer und interpretatorischer Arbeit abdeckt. Violetas („Veilchen“) ist ein lyrischer Walzer, der in kontrastierenden Episoden arrangiert ist. Since Astor Piazzolla’s time, the tango has changed and developed into its own art form, independent of tango dancing and greatly expanding its musical range. 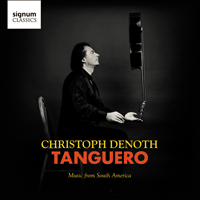 The present recordings aim to express today’s broader definition of tango and exploit the acoustic range of the guitar in order to integrate the tango and its untamed beauty into classical music. Ever since I have been playing the guitar, South American guitar music has had something highly comforting and inspiring for me. Its wealth of sounds is simply fascinating. Since the eighteenth century, the guitar has been the national instrument throughout South America, but especially in Argentina and Spain. Indeed, it plays such a big role that even the Argentinian tango, as we have known it since the twentieth century, would be inconceivable without it. Along with the evangelization in the seventeenth century, its music became an integral part of the country. Many testimonies prove the guitar was played at church services, and that the musicians who played this instrument were highly respected. The same goes for Spain, where Cervantes describes in his Don Quixote a certain Vicente Roca, who plays the guitar so well that it speaks and conquers the heart of his beloved. In the Golden Age, in accordance with ancient Spanish customs, it was expected that a gentleman would woo his love with a serenade. By the end of the nineteenth century, Argentina and Uruguay had become important centres of both tango and classical European music that, in turn, inspired and changed the Latin American style. In the eighteenth century, the Spanish fandango flourished throughout Europe and South America. It was not until the end of the nineteenth century, however, that it was replaced by the newly developing tango. Buenos Aires remains a special centre of this activity where diverse cultures and musical traditions mix. Tango is a form of expression in which light and shadow become palpable. Sometimes playing and dancing the tango relentlessly continued through the night into the early morning hours. At the beginning of the twentieth century, tango provided meaning for people’s lives. Its dark, emotional power can be experienced as an almost animal sensuality combined with subliminal poetry. This music possesses the ability to express itself directly and unmistakably, on the one hand through a strict rhythmic articulation and, on the other hand through poetic, narrative passages. The interplay between disciplined tango rhythms and the melancholic-poetic interludes creates an emotional tonal language of great appeal. In this recording I try to blend the classical playing of European music with the folkloristic origins of the South American pieces into a style of my own. I have added variations to some of the arrangements of individual pieces to render them more varied and colourful. With these arrangements for guitar I wanted to revive the very essence of tango music. My journey led me to Argentina, Uruguay, Brazil, and Venezuela, where this music tells similar stories in a different form in the wonderful song of tango. Depuis l’époque d’Astor Piazzolla, le tango a évolué et s’est transformé en forme artistique à part entière, indépendante de la danse, développant considérablement sa portée musicale. Cet enregistrement vise à exprimer une définition plus vaste du tango contemporain et à exploiter la gamme acoustique de la guitare de manière à intégrer ce genre et sa beauté sauvage au sein de la musique classique. En tant que guitariste, le répertoire sud-américain de cet instrument a toujours été pour moi une immense source de réconfort et d’inspiration. La richesse de ses sonorités est purement et simplement fascinante. Depuis le XVIIIe siècle, la guitare est l’instrument national de tous les pays d’Amérique du Sud, plus particulièrement en Argentine, ainsi que de l’Espagne. Son rôle est tellement important que même le tango argentin, tel qu’on le connaît depuis le XXe siècle, demeure inconcevable sans ses sonorités. Parallèlement à l’évangélisation du XVIIe siècle, son répertoire est devenu partie intégrante du pays. De nombreux témoignages attestent que des pièces de guitare étaient interprétées pendant les offices religieux, et que les musiciens qui jouaient de cet instrument étaient hautement respectés. Il en était de même en Espagne. D’ailleurs, dans son Don Quixote, Cervantes décrit un certain Vicente Roca, qui joue si bien de la guitare qu’il parvient ainsi à toucher et à conquérir le cœur de sa bien-aimée. Pendant le Siècle d’Or espagnol, conformément à l’ancienne coutume nationale, un gentilhomme devait faire sa cour en donnant la sérénade. À la fin du XIXe siècle, l’Argentine et l’Uruguay étaient devenus des centres importants à la fois pour le tango et la musique européenne classique, qui allaient ensuite inspirer et faire évoluer le style de l’Amérique latine. Au XVIIIe siècle, le fandango espagnol s’est développé dans toute l’Europe en en Amérique du Sud. Ce n’est qu’à la fin du XIXe siècle qu’il a été supplanté par un nouveau style musical en développement: le tango. Buenos Aires demeure un centre particulier pour cet art, où se mêlent des cultures et des traditions musicales diversifiées. Le tango est une forme d’expression dans laquelle lumière et ombre deviennent palpables. Alternance de musique et de danse, on le jouait sans relâche toute la nuit et jusqu’aux petites heures du matin. Au début du XXe siècle, le tango donnait un sens à la vie de la population. Sa force sombre et émotionnelle peut être ressentie avec une sensualité presque animale, alliée à une poésie subliminale. Cette musique a le pouvoir de s’exprimer de manière franche et inimitable au moyen, d’une part, d’une stricte articulation rythmique et, d’autre part, de passages narratifs et poétiques. Le jeu entre les rythmes disciplinés du tango et les interludes poétiques mélancoliques produit un langage tonal expressif au formidable attrait. Dans cet enregistrement j’essaie de marier le jeu classique de la musique européenne avec les origines folkloriques des pièces sud-américaines pour créer mon style propre. J’ai ajouté des variations à plusieurs arrangements de certaines d’entre elles pour leur conférer davantage de variété et de couleurs. Avec ces arrangements pour guitare, j’ai souhaité faire revivre l’essence même de la musique du tango. Cette aventure m’a conduit en Argentine, en Uruguay, au Brésil et au Venezuela, où, sous des formes différentes, cette musique relate des histoires semblables au moyen des merveilleuses mélodies du tango. Seit Astor Piazzolla hat sich der Tango verändert. Die Musik hat sich unabhängig vom Tanz zu einer eigenen Kunstform entwickelt und die musikalische Bandbreite des Tangos erweitert. Ziel dieser Aufnahmen ist es, diesem erweiterten Verständnis des Tangos Ausdruck zu verleihen und dabei die klanglichen Möglichkeiten der Gitarre auszuschöpfen, um so den Tango in seiner ganzen, wilden Schönheit in die klassische Musik zu integrieren. Seit ich Gitarre spiele, hat die südamerikanische Gitarrenmusik etwas sehr Tröstliches und Inspirierendes für mich. Ihr Klangreichtum ist schlicht faszinierend. In fast ganz Südamerika, vor allem jedoch in Argentinien und in Spanien ist die Gitarre seit dem 18. Jh. das Nationalinstrument schlechthin. Sie spielt eine so grosse Rolle, dass selbst der argentinische Tango, wie wir ihn seit dem 20. Jahrhundert kennen, ohne sie undenkbar wäre. Gemeinsam mit der Missionierung im 17. Jh. wurde diese Musik und die Gitarre zu einem nicht mehr wegzudenkenden Teil des Landes. Viele Zeugnisse belegen, dass in den Gottesdiensten Gitarre gespielt wurde und dass die Musiker, die dieses Instrument spielten, hoch angesehen waren. Ähnliches gilt für Spanien, wo Cervantes in seinem Don Quixote einen gewissen Vicente Roca beschreibt, der die Gitarre so gut spielt, dass sie förmlich zu sprechen beginnt und so das Herz seiner Angebeteten erobert. In diesem goldenen Zeitalter wurde gemäss alter spanischer Sitte erwartet, dass ein Gentleman seine Liebe mit einer Serenade bezeuge. Ende des 19. Jahrhunderts waren dann vor allem Argentinien und Uruguay wichtige Zentren des Tangos sowie der klassischen europäischen Musik, die ihrerseits den lateinamerikanischen Stil befruchteten und veränderten. Im 18. Jahrhundert hatte der spanische Fandango seine Blütezeit in ganz Europa und Südamerika. Erst Ende des 19. Jahrhunderts wurde er dann durch den sich neu entwickelnden Tango abgelöst. Buenos Aires ist auch heute noch ein Zentrum, in dem sich mannigfaltige Kulturen und musikalische Traditionen vermischen. Der Tango ist eine Ausdrucksform, in dem Licht und Schatten fühlbar werden. Zuweilen unerbittlich, hoffend und flehend spielt und tanzt man bis in die frühen Morgenstunden. Zu Beginn des 20. Jahrhunderts ist diese Lebensweise für viele zu einer Art Rettung und Sinngebung für das eigene Leben geworden. Fast immer ist das Dunkle, Emotionale zu spüren—eine derbe Sinnlichkeit, gepaart mit sublimer Poesie. Diese Musik besitzt die Fähigkeit sich unmittelbar und unmissverständlich auszudrücken—durch die strenge rhythmische Artikulation auf der einen und die poetischen, erzählenden Passagen auf der anderen Seite. Das Wechselspiel zwischen den unnachgiebigen Tango-Rhythmen und den melancholisch-poetischen Zwischenspielen erzeugt eine starke emotionale Klangsprache, die uns immer wieder aufs Neue berührt. In dieser Aufnahme versuche ich, die klassische Spielweise europäischer Musik mit der folkloristischen Herkunft der südamerikanischen Stücke zu einem eigenen Spielstil zu vereinen. Die Arrangements einzelner Stücke habe ich zum Teil mit Variationen versehen, die den Charakter des Stückes abwechslungsreicher und bunter machen. Mit den Arrangements für Gitarre wollte ich die musikalische Essenz des Tangos wiederbeleben. Dabei führte mich meine Reise nach Argentinien, Uruguay, Brasilien und Venezuela, wo diese Musik in anderer Gestalt im wundervollen Gesang des Tangos ganz ähnliche Geschichten erzählt.